Great as an appetizer or as a healthy snack or light meal during the winter! What the Tuscans call Cavolo Nero, black cabbage, we often refer to as dinosaur kale in English. It is widely used in Tuscan recipes, being a key ingredient in Ribollita soup. 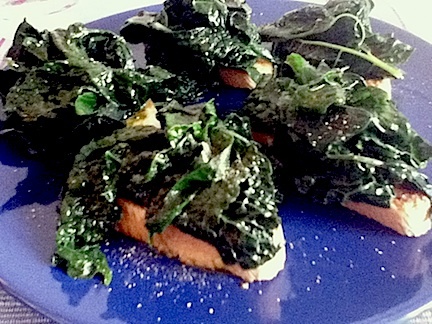 Though fundamental to Ribollita, cavolo nero is great alone, served raw in a salad or cooked over crostini. 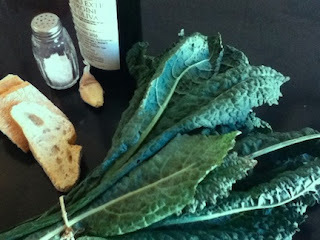 Cavolo nero is best when in season- during the late fall and winter. 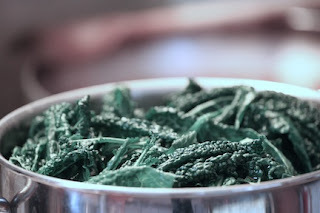 The colder it is outside, the more tender the cavolo nero will be. That's really the only complication. There are no excuses to avoid making this recipe! It is super easy. If you can't find dinosaur kale where you shop, substitute it with regular kale (it will be almost as good!). 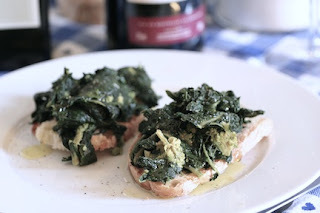 It isn't easy to find cavolo nero outside of Tuscany. Last year during my new year's stay in Venice, I looked all over until finally finding a man in the erberia who sold cavolo nero. My friends were skeptical when they saw me preparing it (especially when they smelled the pungent boiling cabbage smell), but raved as soon as they tried the crostini with cavolo nero. There were no leftovers! ...if you're vegetarian, use a parmigiano reggiano rind (you can even buy these for about $2 at many Whole Foods and other specialty food shops). Crusty bread. The bread in Tuscany has no salt, good luck with that elsewhere! Otherwise a nice ciabatta does the trick. Are you ready to see how easy this is? Put on a big pot of water. As you're waiting for the water to boil, clean the kale by shucking the leaves off of ribs. Leaves above, unwanted ribs below. 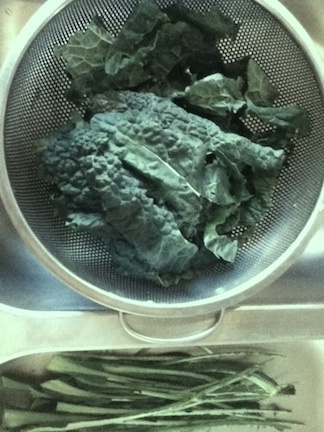 Once you've shucked the leaves off, rinse the kale well to remove any dirt. By this point, the water should be boiling. Throw in the kale, a small piece of pork fat or parm rind, and a couple of pepper corns. hits the hot water it will shrink down. Give it a quick stir before covering. Stir, reduce heat so it doesn't over boil, cover with lid, and set a timer for about 15 minutes. When timer goes off, stir and check the kale. Is it super soft and floppy? If so, it is ready. If not, leave it to cook another 10-15 minutes. Toast or grill 1cm thick slices of crusty bread. 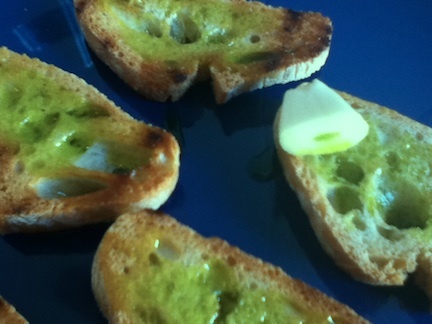 Drizzle with olive oil, then lightly rub a raw clove of garlic over the bread. Drain the kale (optional: save the water to make a nutritious risotto tomorrow or later today). Once drained well, but still nice and hot, serve the kale over the bread and sprinkle with salt and pepper and drown those little guys in Tuscan olive oil. Don't be shy. Tuscan olive oil is good for you! Serve hot, in other words eat them asap. Do you have any kale or dinosaur kale recipes you'd like to share? Please do! 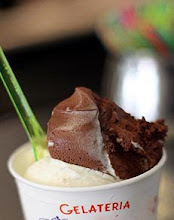 Add a comment or link below or on the Taste Florence facebook page (click on the facebook page at top of blog). By the way, I took your food tour a couple of days after New Year's this year--it inspired me--so here I am living in Florence for the next year! ps- let me know how the recipe goes! I am making it again tomorrow. It is so tasty.